For our most recent ruminations on the identity of Ziyizi, see Sale 3, lot 65. 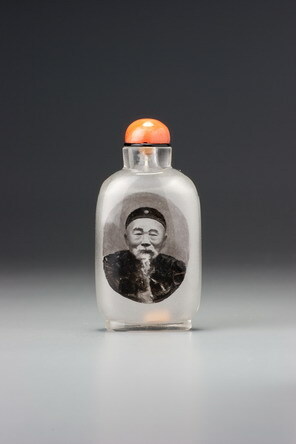 Ziyizi painted a number of portrait bottles, several of them, like this, with different portraits on each side, and some of those with single portraits lacking any inscriptions or signature. It also seems likely that the portrait of Li Hongzhang was taken from the same photograph as another by Ma Shaoxuan (Curtis 1980, p. 2, fig. 3, where p. 6, fig. 8 illustrates the Mullin Ziyizi portrait of this same figure, and p. 1, fig. 2 shows the photograph from which they were all taken). Although this bottle is unsigned and undated, there is no question as to its attribution, since Ziyizi’s style in general is not easily confused with any other artist’s, and his portraits are quite distinctive. The date is less certain. Li Hongzhang died in late 1901, Prince Qing in early 1917; and although these portraits could have been done after their subjects’ death, it is more likely that the bottle was commissioned while Prince Qing was alive. He was very powerful but famously corrupt, and whoever commissioned this bottle must have hoped to curry favour. 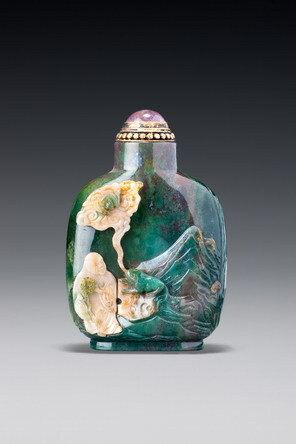 Or, the person who commissioned the bottle may have supported Prince Qing’s conciliatory attitude in 1899 – 1901toward the Westerners and his disdain for the Boxers and their ilk. In fact, one reason to picture the two men together is that they were both signatories to the Boxer Protocol in 1901. Ziyizi painted his only two dated portraits in 1906 and 1907, the latter being his masterpiece from the J & J Collection; it is unlikely to pre-date this example. It seems, therefore, that this one must have been painted at some time between the turn of the century and 1907, perhaps closer to 1901. Ziyizi’s style of portraiture is distinguished from Ma’s by a number of features. The most telling difference is in the use of chiaroscuro. There is a much greater sense of dark and light in Ziyizi’s portraits, partly because of the darker frame he so often used, but also because of the heavier and more realistic shading. There is a much greater impression of studio lighting in his portraits. What is intriguing and may suggest that most of his portraits were done prior to 1906 is that the two that have the least chiaroscuro are those dated to 1906 and 1907, the latter being much closer to Ma Shaoxuan’s style in the shading of the face and more subtle and evolved than these. For details on Prince Qing, together with a photograph from which this painting was taken, see JICSBS, Autumn 1985, p. 132. The signature that appears most frequently on his paintings is Ziyizi, his Daoist assumed name, (fig. 1), unless Ziyuan (fig. 2) is another name for Ziyizi. His seals were yuan yin (fig. 3), possibly derived from the Ziyuan name if, indeed, it is his, and yin (‘seal’ — fig. 4), and two others we have not been able to decipher (figs. 5 and 6).